광주이씨 출토복식은 1979년 4월 20일경 경기도 시흥군 과천면 막계리 소재의 광주이씨 선산묘지를 남서울 대공원 부지 조성관계로 이장하던 중 이언웅(李彦雄) 묘와 그의 자부(子婦) 청주한씨(淸州韓氏) 묘에서 출토된것이다. 이언웅은 생졸년을 알 수 없으나 그의 아들, 손자의 생졸년으로 보아 중종에서 선조대의 인물로 추정된다. 청주한씨는 중종(中宗)의 2녀 의혜공주(懿惠公主)의 손녀이며, 이집일(李執一: 1574~1613)의 부인으로, 결혼 한지 얼마 안되어 사망하였다. 이들의 묘에서는 단령과 철릭 등 복식류와 수의용품 등이 수습되었다. 이들 복식은 문중에 의해 남녀복식이 섞여서 기증되어 이언웅의 것인지 청주한씨의 것인지를 구분하는데 어려움이 있었다. 그러나 화려한 치마가 출토되었고 이와 함께 출토된 저고리가 대부분 목판깃으로 화문단 금선단 등의 직물이 사용된 점으로 보아 청주한씨의 저고리 임을 알 수 있다. 이처럼 화려한 직물로 만들어진 저고리와 치마는 16세기 사대부 집안 여성의 차림새와 멋을 잘 보여준다. The shrouds of Gwangju Yi’s Clan were excavated on April 20, 1979 from the graves of Yi Eon-ung and his daughter-in-law, Lady Han, from Cheongju Han’s family while moving Gwangju Yi's family graveyard in Gwacheon-myeon, Gyeonggi-do due to the construction of a theme park. The birth and death dates of Yi Eon-ung are not known; according to those of his son and grandson, however, Yi Eon-ung probably lived between the periods of King Jungjong and King Seonnjo’s reign. Lady Han was a granddaughter of Princess Uihye -- who was the second daughter of King Jungjong -- and a wife of Yi Il-jip (1574~1613). Ceremonial robes such as dallyeong and cheollik as well as burial shrouds were excavated from the graves. The clothes were donated by the family in a condition wherein the male and female clothes were mixed, so it was not easy to differentiate which ones belonged to Yi Eon-ung or his wife. 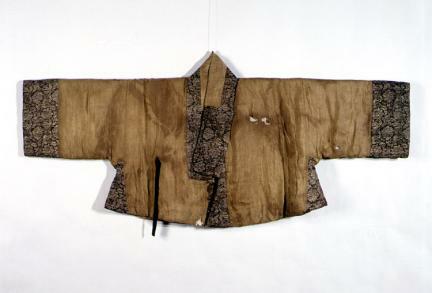 Note, however, that splendid skirts and jeogori (jacket) have mokpangit (square collar), and they were made of flower-patterned fabric; thus, the jeogori must have belonged to Lady Han. As such, the jeogori and skirts made of splendid fabric show very well the fashion and style of clothes worn by high-class women in the 16th century.